I heard about it a few years ago and it’s literally as it sounds. No spending during the month of January, or any month you choose. I know people that do No Spend November but you can do no spend months, or weeks anytime you like! I chose January because I really want to get to grips with my spending this year and although I’m a minimalist, I still seem to waste money on things that I definitely don’t need. Anyway, if you’d asked me last year, I would have told you, that I tried it and failed after just three days. I’m the kind of person that if I’m told to do something I will do the opposite, so in a way I defied myself, but I guess more than that, I just wasn’t ready. 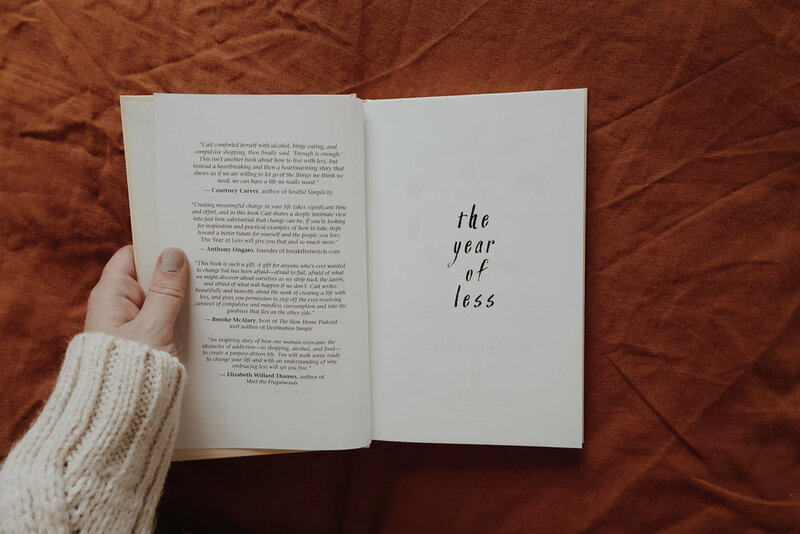 This time around, I felt like I knew my spending habits a little better and had spent a good part of the previous year, trying to track my spending and work out why and when, I spent what I did. You see, money and me have a tricky relationship. I spent most of my adult life in debt - after being told that it was a good thing to get credit, as early on in adulthood as I could. And the ripple effect, of myself and my husband’s spending outside our means had drastic effects on our marriage. There were years spent in the never ending cycle of borrowing, paying back and then borrowing more, just to keep our heads above water. There have been some very hard times but for the first time in my adult life, I am finally debt free and so living within my means and watching where my money goes, has become really important to me. But life gets in the way. And as a stay at home mother, it’s easy to pop to the cafe for a bit of fresh air and adult company, to buy a box of chocolates from the local shop, or to add another book to my amazon basket, as a well deserved ‘treat.’ because books are life right? So, after becoming a bit lost with my sending habits, I was ready for January and the challenges it would bring. Could I live without these so called extras I told myself I needed? Could I really save more money and could I really change a habit in 31 days? Aside from usual bills, we could spend on fuel and the weekly food shop but anything outside of the weekly shop wasn’t permitted. That meant that I had to meal plan and forgo my usual trips to the shop, (which I doing pretty much daily and was rarely within budget.) I thought that this would be really hard but surprisingly, we quickly got into the habit of doing the big shop once a week, with a very small top up, for fresh food towards the weekend. Because I was meal planning, the top up was taken out of the original budget, which I was really pleased with, as I am notorious for going over budget with food every single month. We honoured educational trips that were already planned but avoided the restaurants and luckily, the gift shops. We met friends in parks with keep cups rather than in cafes but without the promise of tea and cake, it made it harder to get the children outdoors in cold weather. However, with determination, more often than not we managed it! If something needing replacing during the month, such as socks or other essentials, we would replace it but aside from an item for my son, we managed just fine. So with the rules in place, we were all set but even with renewed enthusiasm, I found the first week as hard as I knew I would. I mean, I just couldn’t stop thinking about pizza. And not just any pizza, a certain kind made at a certain restaurant and it was on my mind 24/7. If it hadn’t been so annoying it would have been comical, as we hardly ever eat out at restaurants but I just couldn’t shake this want. However, due to some vouchers gifted to us by family as an anniversary gift, I was able to get my pizza fix in week two of the challenge and believe me it tasted so good! During week two, I noticed that I was thinking more and more about stuff. Things were added to my amazon basket, with promises of it all being mine in February. It seemed to be something that I needed to believe and so, as more and more ‘essentials’ got added I convinced myself that I would have them all. Week three went much the same as the previous week, my mind was preoccupied with things and I spent more time than usual, scrolling my phone, thinking about what else I would need. However in week four, or was it five? man January was long, I felt a shift. I realised that I was okay without all of these wants in January, so I would probably be okay in February too. It had actually been a surprisingly happy month, despite not being able to spend money and so I started to wonder, if I could carry this mindset forwards. I realised that for the first time in a long while, I was actually looking forward to looking at my bank balance and instead of seeing a frustrating amount when I did look, I saw the numbers go up. And I’ve got to say, that feeling’s addictive! I slowly took things out of my amazon basket, except for the things that were already in there from the 30 day rule. (I tend for wait 30 days or more, to purchase bigger items, so that I can make sure it’s something I really want or need.) And I instantly felt calm once this stuff had been deleted. It was as if these items was already causing me stress and I didn’t even own them yet. Proof alone, that I didn’t really need them in the first place and another lesson learnt right there. But the biggest surprise of all, had to be the children. They are use to getting stuff, especially my son, who absolutely adores things. But after talking to them about our no spend month and actually following through on my part, they managed just fine. Granted it was just after Christmas, but my son tends to obsess over getting something new regularly, so for us, this was huge progress. I’ve got to admit that I did buy them both something when February rolled around but we used their money and explained, that we wouldn’t be buying toys as often as we previously had. This sentence alone makes my minimalist self really happy!. My son has actually been a lot less anxious since buying less because although he loves things, they also cause him great anxiety, so this has been interesting and reaffirming to watch. So aside from the children, February the 1st came and went. We promised ourselves a proper coffee in a cafe that first weekend but when the time came, we decided to just make our own. It seemed strange to pay extra for coffee, when we had been making it ourselves for the past month and yes, it didn’t taste as nice but it was good enough! And of course that isn’t to say that I will never go to cafes again - if you know me, you will know that they are one of my favourite places to go. But sometimes, going without can be useful, in working out what’s important and I know that when I do sit in a cafe and take that first sip, it will taste all the sweeter for it. Another thing I did, which was recommended to me by a follower on instagram, (if that was you, thank you so much!) was that, if ever I wanted coffee, cake, a bunch of flowers, or a book and I didn’t buy it - I would move the money saved straight into savings. And it may only be £3 here or £5 there but it all adds up and it’s amazing what you can save, just from this process alone. We managed to save a good amount during the month of January - a lot more than I thought we would. And this has really made me think, about how much money we were wasting day to day. We were able to double our usual monthly savings and now we’ve come to the end of our no spend month, we are keen to continue saving as much as we can. And I don’t think that we can manage a no spend year, as many people do but we are really keen to have a more intentional 2019. We have some huge goals to save towards, which will give us an even more simplified life, so it seems only right that we carry on living as mindfully as we can. There is one particular thing that we want to do and our January spending ban has opened up doors to us, that we didn’t think possible. No Spend January has really made me think about how and why I spend my money and reminded me - that so much of my shopping is emotional. It was hard, it was infuriating but it was completely and utterly worth it. 1. Know your why. To do something like this, you’ve really got to know your reason for doing so. My main ‘why’ was to work out why I spend what I do, the savings were just a huge bonus! 2. Talk to friends and family in advance about what you are doing. I found that most friends were really happy to save money by meeting at free places such as parks and beaches but for you, that may mean museums or other places of interest. Have a look in your local area and see what’s free, you may be surprised! 3. Make rules that are realistic for you and your family. This increases your chance of success because, only you know what you can live without! 4. Have accountability. Be that a partner, a friend or posting about your spending ban on social media. It will make you think twice, knowing that you’ve told others about it and it’s always good to have someone to talk to, when you want to buy something at 10pm! 5. Read others experiences. In a world of more, more, more, reading and listening to those that are intentionally not spending, will really focus your thoughts. I love Cait Flanders and her book The Year Of Less, for this. 6. If you walk past a coffee shop/other vice and resist going in, move the money saved straight over to your savings account if you have one, it all adds up. 7. Above all else, give yourself grace. Breaking habits isn’t easy and more often than not, our spending habits, are as they are for a reason. So rest assured that even if you slip up, or decide to give up after a few days - you will know more about yourself and what drives you to spend. So that nothing is ever wasted! I’d love to know in the comments how you get on if you do decide to do a no spend month, or if you’ve done one, along with any tips on spending intentionally if you have them. I’m over here cheering you on friend!